Creative’s latest flash-based player seeks to compete against hard-drive based models. The new 32 GB Zen is now the largest flash-based player available on the market. 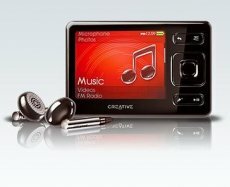 The previous “largest” title was held by Creative’s Zen and Apple’s iPod Touch, both players featuring 16GB of storage. The current 32GB model can store around 8,000 songs or 120 hours of video, with the battery life supposed to be around 25 hours of continuous music playback or 5 hours of video. The 32GB Zen player will first be launched in Singapore in mid-December and will retail for $379. No release date has been unveiled for the US, although potential shoppers have been informed about the price: $329.